After almost three weeks of day drinking pitchers of sangria, soaking in the sun on Zurriola beach, and trying so desperately to look like locals, our time here is dwindling. These next two days is our time to rally, our last chance to do the things we have been pushing off. Today we had some free time before we ventured off to the cider house. As goes everyday, we all went to school until 1pm and then were free to venture off and do our own things until mas o menos 6:15pm. As goes for me, I spent a lot of time deciding what I really wanted to do these last few days. I think what we have each chosen to do these last few days really reflects what we value most about this beautiful area of the world. As for me, after school I went to my favorite little Michelin recommended restaurant in Gros. I got bacalao tortilla and a few pinchos. Whenever I travel, my main focus is on the food. For me, its how I am able to fully embrace the culture of an area. Everyday here in San Sebastian, I have gotten a cup of hot chocolate and a tortilla patata. Each place I have gone to has had their own spin on each. The hot chocolate of Europe is quite possibly a little window into what heaven resembles. I’m pretty confident that all they do is melt a bar of chocolate and serve it in a cup. After weeks of biking around the city, climbing mountains, and visiting museums I just sat down into a cafe a took a breath and reflected for a bit. My roommate Martha and I live in Amara, which is far from the central part of the city; away from the hustle and bustle. At first this seemed like it was going to be terrible. We were far from our friends and all of the “cool” parts of the city. However, we had an absolutely wonderful host family and we had the chance to explore a different part of the city that we would have never gone to. We rented bikes so that we could easily maneuver the city. Since we did this, I feel like I was really able to gain a deeper understanding of the city. Three weeks somewhere seems to be just enough time for you to feel like you have almost mastered a city, but yet still have so much to explore. I’ve now been to every neighborhood, burned on three different beaches, and been mistaken for a local. 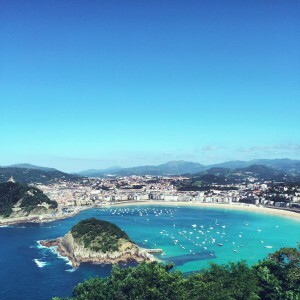 The moment I realized that my three weeks here in San Sebastian would never be enough time was when I was in an underground mall. I was buying some fruit and a man next to me was trying to communicate to the woman who worked behind the counter. He only spoke english and she only Spanish. He was looking for the fish market. I jumped in and acted as a translator. They were both so grateful and I was actually successful in communicating! It was a shining moment. However, I realized not only my Spanish, but my understanding of the layout of the city was much more minimal that I thought it was. 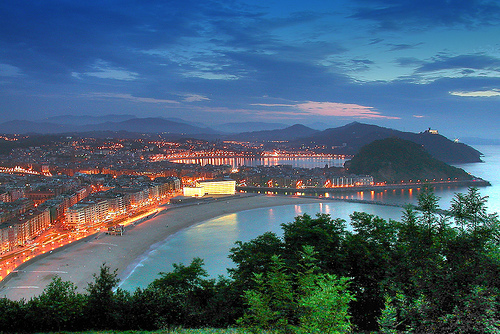 On this trip, we have each gotten such a sweet taste of San Sebastian and Basque culture. We cannot forget that there is still more to learn and more to explore. That very night we all had another new experience at a Siderria! I had tried the cider in a few bars, but I wasn’t the biggest fan. To me, the taste had resembled a watered down apple cider vinegar with a hint of beer. So when I heard we had unlimited cider to drink I wasn’t as excited as I should have been. Once we arrived, we went on a lovely tour of the grounds and learned how the cider was produced. For lack of a better way to say it, after the tour we each took two, maybe three “shots” of the cider, as it is traditionally drunk in such a way. 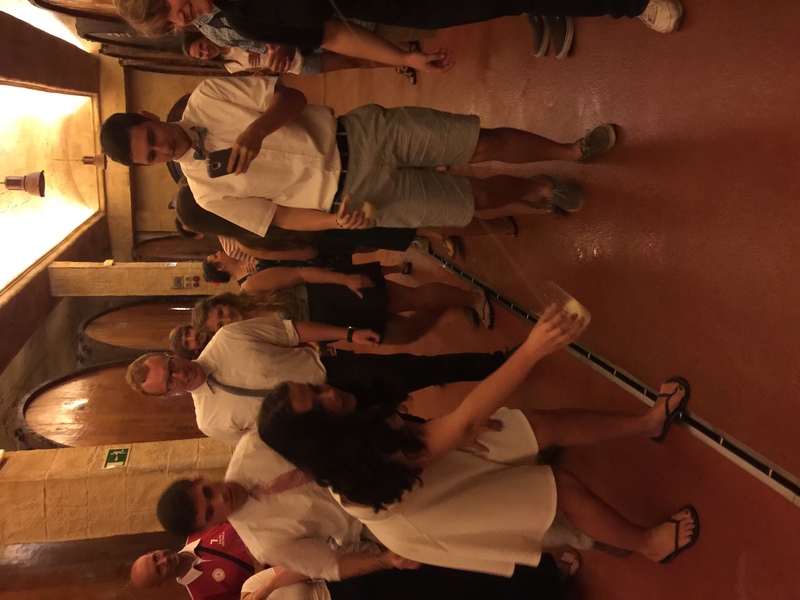 We were taught how to open up the tap to the giant barrels of cider. Once the tap was opened we formed a line, one person after another filled up their glass, drank, and got back in line. Parents and guardians, its not quite as crazy as it sounds, but it sure was fun! After those first drinks we went inside to enjoy dinner. 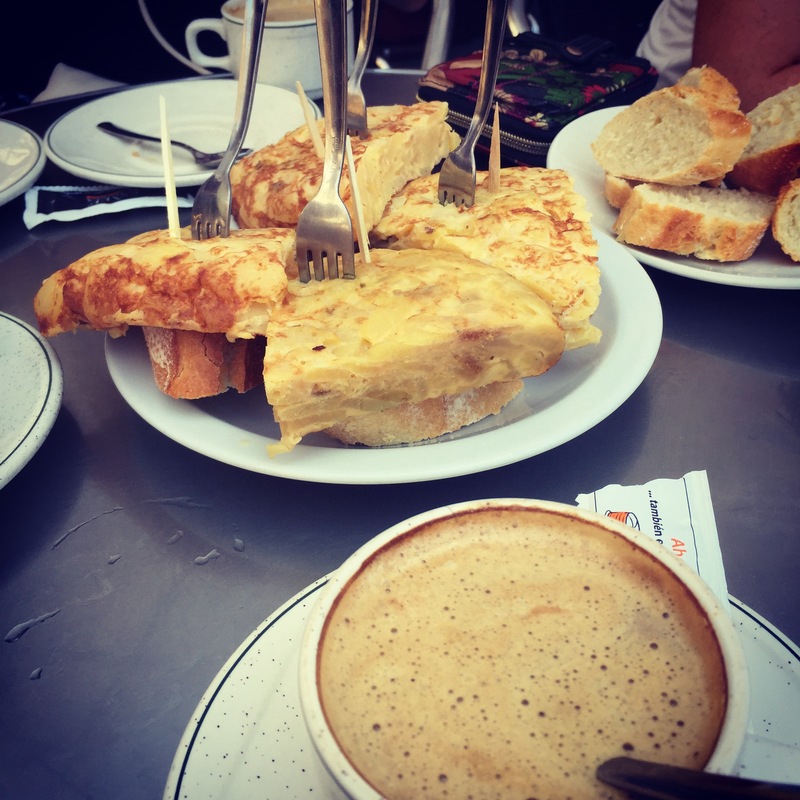 First course was tortilla de bacalao with bread, which is essentially a world class salted cod omelette. This is a traditional Basque dish. Second course was salt cod with peppers and onions. By the time the third course of steak rolled in, most of us were already stuffed. However, if you were brave enough to indulge in the rare deliciousness of the steak it was worth it. I personally eat my steak, well done when I am home.My perspective has now changed. I think I have literally been cooking the flavor out. We topped the night off with some queso, cookies, and walnuts. The taxi’s picked us up at the door and then we each went our separate ways home. Although it was only 11:30pm, as far as I know everyone went straight home. Were all exhausted and stuffed to the brim from a delicious meal and glasses of cider. I couldn’t have imagined a better way for us each to spend our night. We were together as a group for the last time. We sat at big long tables, laughing, eating, and drinking together. Now we are heading off on other adventures. As for me, I am stuck here exploring the south of Spain for three more weeks. To all of the new friends I would have never met, thank you for making each night adventure filled. To Sean and Julian, thank you for creating this program and guiding us through the city. The people and this city have left a lasting impression on me and it has made it into my top 5 favorite places. This entry was posted in Uncategorized by mara_tzizik@student.uml.edu. Bookmark the permalink.